I find it funny that the cut of chicken that is most popular and most expensive is, to me, also the most bland right out of the gate. And yes, I’m talking about the ever present boneless skinless chicken breast. It’s far from my preferred cut of chicken, but I’ve been using it more these days actually. 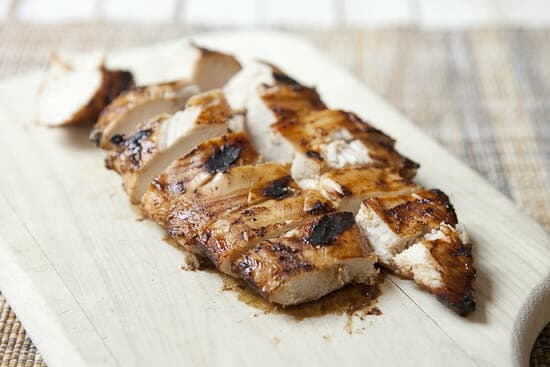 There are two issues with cooking with BS chicken breasts (boneless skinless…). First, it’s actually hard to cook them without drying them out. It’s much easier to cook something with the bone-in and skin on because it will keep the moisture in better. Second, they are just plain bland. Even if you buy quality chicken, it still doesn’t taste like much. 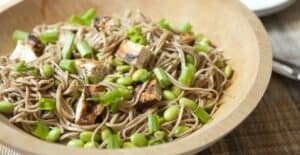 I solve both of these problems in this delicious Chicken Soba noodle salad recipe with a really simple, but complex tasting, marinade. Marinated hoisin chicken grilled and tossed in a light dressing with soba noodles and edamame. Great dinner or lunch noodle salad! 1) Whisk together all ingredients for marinade and add chicken. Coat chicken well in marinade and let sit for at least 15 minutes, but you could make this well in advance. 2) Heat grill (or grill pan) to medium-high heat. Add marinated chicken and let grill for about 7-8 minutes per side until it’s cooked through. If your chicken is really thick, it might need another few minutes. Ideally, use a meat thermometer and cook it until it hits 165 degrees in the thickest part of the chicken. 3) Let chicken rest for a few minutes after it comes off the grill and the slice into big chunks. 4) Cook soba according to directions. 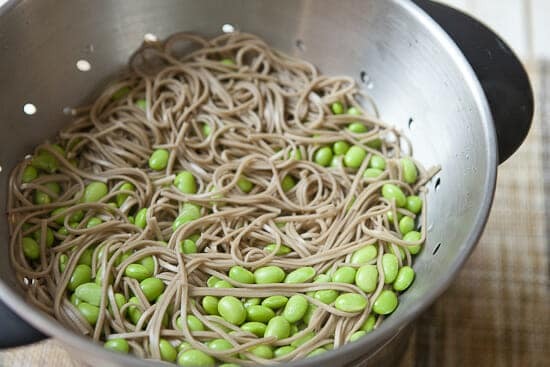 When the soba has 2 minutes left to cook, add edamame to the same pot to thaw them. 5) Drain soba and edamame and toss with rice wine vinegar, sesame oil, and chili sauce. Season with a pinch of salt or a dash of soy sauce. 6) Toss soba and edamame with chicken and garnish with scallions. This dish is great hot or cold. 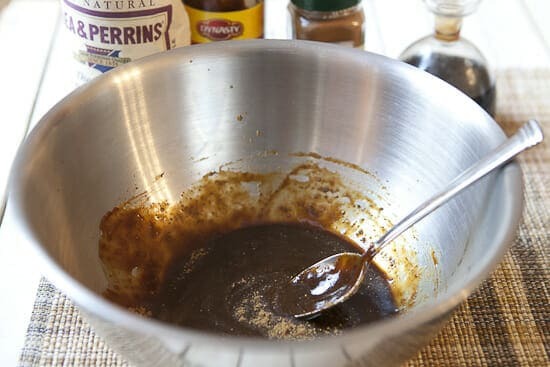 This marinade is a combination of some of the most flavor-packed things in my pantry: Hoisin sauce, balsamic vinegar, worcestershire sauce, and five spice powder. Rub this all over the chicken and let it sit for at least 20 minutes. In reality you could marinate these guys overnight even. Since it’s grilling season (sort of), I highly recommend dusting off the grill for these guys. 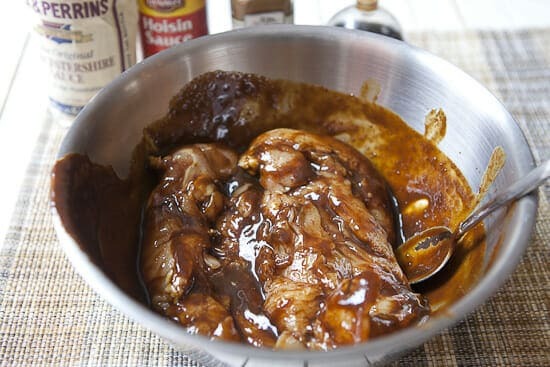 It gives them some nice color and use can use any leftover marinade to baste the chicken as it cooks (just don’t put any marinade on the cooked chicken once it’s off the grill since the marinade was in raw chicken). They will need 8-10 minutes per side to get cooked through, depending on the thickness. A meat thermometer is a good idea if you are worried about over or under cooking them. 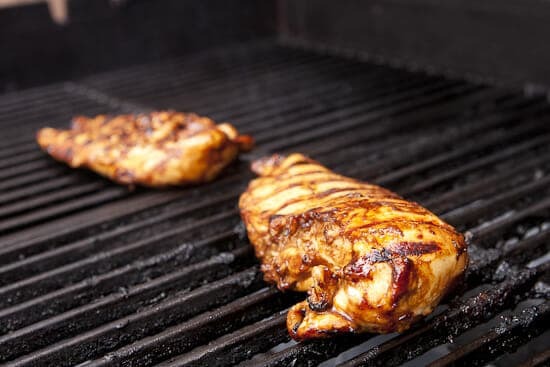 You are shooting for around 165 degrees F.
When the chicken comes off the grill, let it rest for a few minutes and then slice it into big chunks. I have a mild soba obsession these days and have been using it a lot for noodle salads and stuff. I like it because it cooks fast but also has a more robust flavor than spaghetti. Cook your soba according to the package and when there is 1-2 minutes left, toss in the frozen edamame as well. You could use peas if you can’t find edamame. Then you can drain everything together. Toss the noodles and edamame with the rice wine vinegar, sesame oil, and sriracha. Add the chicken and stir everything together. 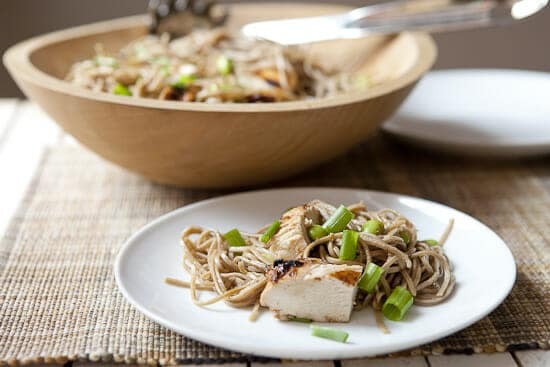 Spoon up the Chicken Soba with lots of fresh scallions as a garnish. There are many things that are lovely about this Chicken Soba dish, but I love it because I think it might be better on day two when it’s cold and the flavors have had a chance to mingle in the fridge for a night. So there you have it. My solution to dealing with bland chicken is to blast it with flavor. And yes, if you want to use a different cut of chicken for this Chicken Soba, you certainly could. The truth is I use BS chicken breasts because my wife likes them and you know what they say… happy wife. Happy life. Oops! I just re-did the design on the site and am still getting used to some of the stuff. Refresh the page now and the full recipe should show. If you just want the ingredients and step-by-step directions you can click “Print Recipe” in the recipe box. Thanks! Nick! My fiance and I have the same issue as you and your wife regarding chicken breasts. I’d much rather use bone-in thigh/leg meat, and he’s a chicken breast lover. Usually we resolve this by either 1) marinating the daylights out of breast meat, or 2) Taking the meat off the bone and shredding after it’s been cooked so at least we have the flavor. This is a great recipe, and I’m so glad to hear we’re not the only household that has this issue :) Keep up the great work! May I recommend that during the last 30 seconds of grilling the chicken you finish it off by BLASTING them. Close the lid and crank all burners on high. It’s how a good chef finishes all food on the grill. I agree about BS chicken breasts being on the bland side! But they are so easy it’s good to have some good recipes for them…this looks good! « Cheddapeno Cream Cheese Recipes Home » Book Launch Karma!